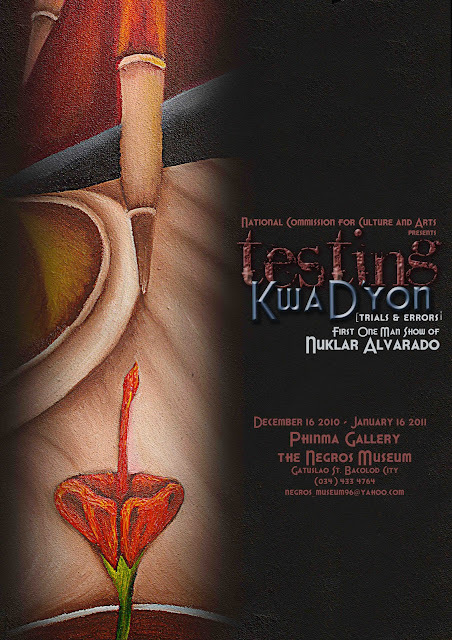 NUKLAR ALVARADO will have his 1ST one-man show entitled “Testing Kwa Dayon” at The Phinma Gallery of the Negros Museum opening on Thursday, December 16, 2010, 6:30 PM. National Commission for Culture and Arts is sponsoring this exhibit and this will run until January 2011. This will include more than 15 recent works of Nuklar Alvarado. “Nuklar”, as called by his fellow artists, started painting real early and is a self-taught artist. He believes that painting is already a part of his being. The artist admits that it was natural for him to go into the art scene because of his family. Nuklar is the son of the Negrense artist Nune Alvarado and brother to two other painters. RSVP 09173007742 for the exhibit opening. For inquiries, please contact Paolo Fortaleza at 034-4334764 or email negros_museum96@yahoo.com.